Reminders are a new addition to Jiffy 2.3. Designed to help you stay on track with time tracking. They are set by default to trigger 30 minutes after your start time. 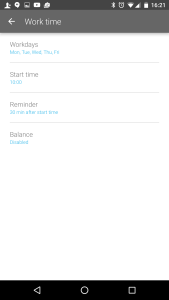 The start time defaults to 9:00, so reminders will show on workdays when you have not tracked time before 9.30. 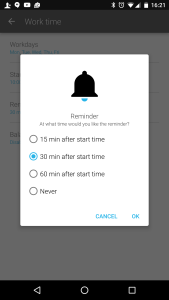 You can edit the reminders in Settings -> Work time by changing start time and reminder.